Ever notice how an MRI is kind of like a ride on Disney’s Space Mountain? Except you’re stretched out flat and you don’t hear any screaming, just the occasional nervous voice inside your head that asks how you let yourself get trapped inside a giant cigar tube. But the line is almost as long. Now take a look around the rest of the hospital. You find that the woman filling out the paperwork in the admissions office sounds an awful lot like Minnie Mouse, and discover later that the third shift nurse is a little goofy. So it may not surprise you to learn that an increasing number of hospital chains have been turning to Walt Disney Co. for advice on how to make their facilities more enjoyable and satisfying for their customers guests patients. Since last October, 25 hospitals have signed up with the entertainment giant to help train their staffs to offer better service, according to a piece published Thursday in Kaiser Health News. The reason: Starting next year, Medicare will partially base its payments to hospitals on patient satisfaction. Facilities that offer surgery with a smile and a cheery morning hi-ho will get a little heftier reimbursement from the federal program. Here’s the way it works. In October 2012, Medicare will start withholding 1 percent of its payouts to hospitals and the money will accumulate in a pool — to be given as bonuses to facilities with the highest patient ratings. Disney consultants, according to Kaiser, advise staff to dress neater and wear pleasing name tags that can be more easily read by the patients. Another suggestion is to have “on-stage” and “off-stage” areas within the hospital, so that employees know to look and act sharp when they’re in the public eye. And they would like employees to consider rotating jobs so that they stay fresh. Brain surgeons, for example, might be asked to slide over to colonoscopies for a couple of days just to get a new perspective on things. No, just kidding on that last one. They’re only talking about non-medical personnel. I think. You think I kid. Details of the Barton Memorial Hospital training regimen are online at the Disney Institute website. You can read it for yourself, but one of the innovations mentioned is that Disney employees only wear badges with their first names – no titles. Scoff if you want. 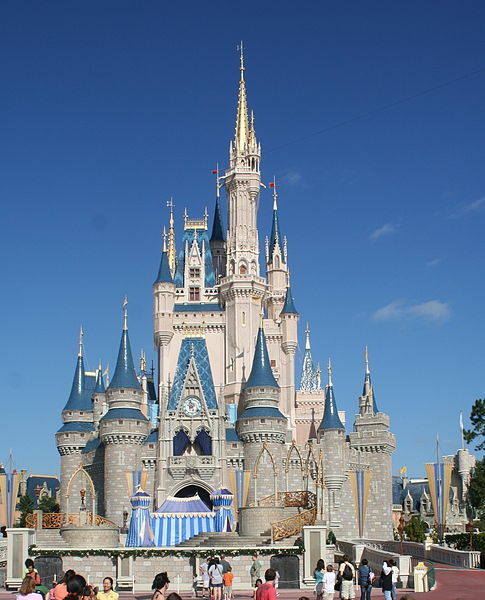 The hospital says it has saved money after implementing the Disney program by reducing turnover. Administrators claim they’re saving $200,000 a year just by not having to hire contract nurses. Oh – and the number of patients who now say they would recommend Barton has jumped 10 percent. Are you listening, Dr. House? How are you fixed for outrage this week? The Casey Anthony trial is over but not to worry — you can always look to Washington for a fresh infusion. Those fine folks seem to generate an unlimited supply. The sniping, the back stabbing, the fiddling while the empire moves to the brink of economic catastrophe over the debt ceiling. It’s an outrage. Or, if you’re looking for one a little more relevant to family values, check the July 3 issue of the Journal of the American Medical Association. It contains a commentary suggesting that extremely obese children should be removed from their parents’ home and placed in foster care. About 2 million kids fall into that category. The piece, “State Intervention in Life-Threatening Childhood Obesity,” was written by David Ludwig, a physician, and an attorney, Lindsey Murtagh. My view is that although this type of solution to a worrisome health problem may be well-intended, opening the door to more state control over families and child raising is unwise. It would be one thing for a government agency to suggest help for an entire family — to nudge them back on track. But removing children from a home should only be done as a last resort and when there’s physical abuse involved. I don’t think buying your kids too many bags of Fritos and cartons of rocky road ice cream — and yes I know there are health consequences — rises to that level. In short I found the idea … well, outrageous. So, don’t argue with me on this point. Other expressions of outrage, related and unrelated, are of course welcomed. I would add that outrage has another benefit of allowing us to reset our moral compasses. That’s why outrage is such a valuable commodity and is peddled on cable TV shows morning, noon and night. 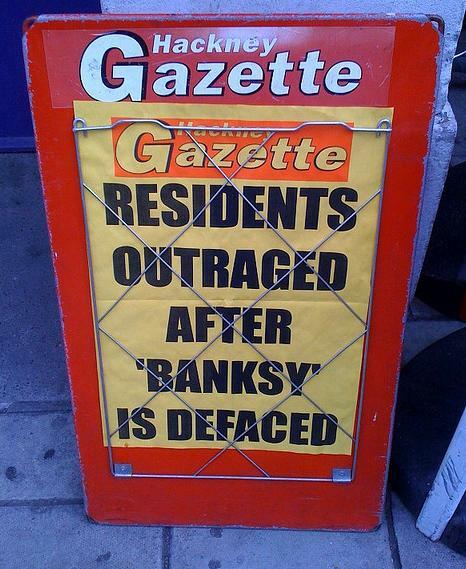 I found an interesting story from The BBC in November 2009 about a mural by a graffiti artist named “Banksy.” Local officials asked area residents whether the “punk” mural should be maintained — and 93 percent of those who voted said yes. But while the vote was taking place, some freelance graffiti hacks defaced it. Yup, even outrage has its ironies. Sneezing and wheezing is a way of life if you’ve got respiratory allergies. Many moons ago, I went through all the tests to find out what airborne particulates give me the most trouble. The list looked like an inventory report for a typical Florida outdoor plant nursery. Indoor stuff gives me fits, too, not a good thing when you have to keep the house shut up during most of the summer months. And I explained that it’s a unit you keep inside of your house and it continually filters the air. In with the bad, out with the good. I’d seen them advertised on TV, maybe the Home Shopping Network. But as I continued to explain what I needed, his eyes glazed over. A customer overheard what I said and knew exactly what I was talking about. He gave me a business card with the name of a dealer who sells these types of systems as a sideline. But checking out the website I noticed one thing immediately: They’re expensive! You can spend up to $800 on a system, which is a little more than I had in mind. Which brings me to the University of Michigan. A research team at the school’s “Sinus Center” developed a cheap, homemade air filtration system you can slap together in three easy steps. And their tests show that it works. As you can see in the photo, above, the UM researcher demonstrating the system is wearing a white lab coat, so you know this is serious science. If that doesn’t give it the stamp of authenticity, I don’t know what would. 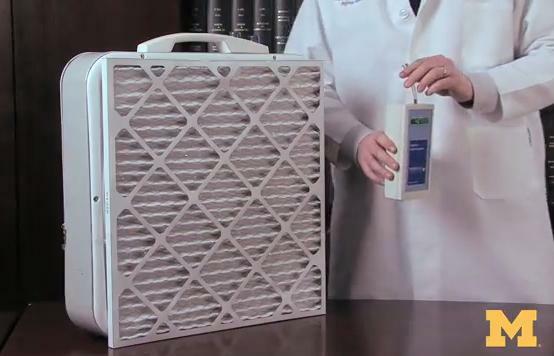 “This is a filtration system that you can put together with items from your local hardware store for $25 to $30 and use in your home to cut indoor allergens by about 90 percent,” said Jeffery Terrell, director of the Sinus Center. A demonstration of the system is available on YouTube. Basically, it’s just a box fan with an air conditioner or furnace filter taped to the front of it. Air is drawn into the fan, the filter screens out the allergens and the clean air is blown back into the room. No muss and no fuss, and this is also a great way to use up that leftover duct tape you purchased to patch your car seats. Make sure you change the filter often – it’ll turn a brownish color after enough particulates are trapped. And so you can breathe easier without busting the bank. Teenagers and college students are sprinting ahead when it comes to electronic communication and their parents and older friends are huffing and puffing to keep up. I see this even with my own daughter, although she’s married now and starting her own family. At least half our communication is through texting, and it surprises me how quickly she can tap out a message. The little chime goes off on my phone and I usually reply, but for me it’s a more laborious process of hunting and pecking, and sometimes backing up to get it right. It’s hardly second nature to me. I was reading through some facts and figures about technology assembled by the Aspen Institute, comparing generational attitudes, when I realized what a huge gap there actually is between young and old, and teens and their middle aged parents. For example, 80 percent of people between 18 and 29 use a wireless Internet connection on laptops, cell phones and other devices. But only about a third (34 percent) of people 50 and older use a wireless connection in the U.S.
That may not be as surprising as this tidbit: There was a 59 percent drop in email use by kids age 12 to 17 in 2010 as these young people flocked instead to social networking sites. 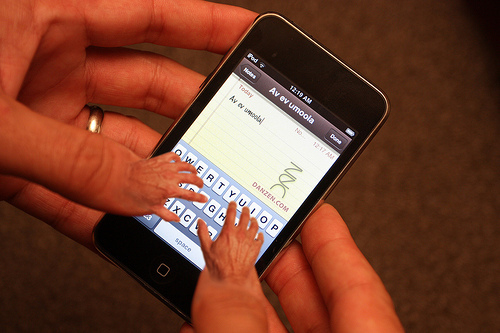 The average teen sends 2,200 text messages per month. The Guardian in the UK cites examples of kids sleeping with their phones and taking the phone into the shower, wrapped in plastic, so they don’t miss a beat. Ofer Zur, a psychologist in Sonoma, Calif. has been looking at what he calls “the digital divide” – the differences in attitudes and thought processes between people born into the world of digital technology (“digital natives”), those who have adapted to it (“digital immigrants”) and those who still refuse to embrace it. The problem is that the digital divide causes tension and clashes at home and at school, Zur says. “Parents witness their children doing homework while text messages are flying, videos are streaming, Facebook profiles are updated, Twitter is checked every couple minutes, Internet browsers are open, the loud rock music is blaring from iTunes in their ear buds,” he says. “On top of all that, many children need to also deal with nagging parents complaining about their multitasking. Parents see an increasingly isolated child who already spends a lot of time alone. But Zur believes parents should realize that the teens are “engaged in an intricate and highly social online game with thousands of other children from all over the world or is deeply engaged in socializing with his best friends or intimate partner on Facebook. He suggests parents get more involved with their kids’ online activities and even ask for their help in figuring out the latest high-tech gadgets. If you think teens and college students are in uncharted territory, Zur says you ain’t seen nothing yet. In other words, the divide is about to turn into a generational Grand Canyon. It will be increasingly difficult for many of us to bridge the gap.